Socialization in dogs is a very important aspect that allows it to be social, amiable, and ready to be trained. The concept involves the dog to be exposed to its own species as well as those from different species of dogs. It must also interact with people, environment, kids, and other animals too. Dogs aged 4 weeks to 4 months must be intensely socialized as this time they are prone to imbibe social skills. Socialization is a life-long process and must be encouraged at all times in a controlled manner. Dogs become a better pet when they are exposed to all kinds of people, animals, and situations. Dogs imbibe new wanted traits when they voluntarily mix with surroundings and not forced to do the same. 4 weeks to 16 weeks — The dog is expected to play and learn social skills, understand social ranking among their own species, pick up physical co-ordination skills, and learn inhibited biting. Understand surroundings, littermates, pet care givers or dog owners who own the puppy. Understand the relation between the people or animals it generally spends time. …You can allow the puppy to greet, interact and play with other dogs and mix with people around. Mingle with its litter mates. Learn about itself as a dog. Intensely mix with litter mates and get influenced by them. Deeply mingle with the people they stay with – such as pet-sitters or pet owners. Explore new areas, try out new things, and tread into unknown territories. …You can inculcate a positive trait and get them trained as social animals. Hone its physical co-ordination and skills. Get house-trained and become a well-bred pet. Distinguish fear, danger, and worry. Get alarmed by potentially dangerous objects or situations. …You can start off with intense dog training and behavioral therapy as the pet will be able to pick up the traits. 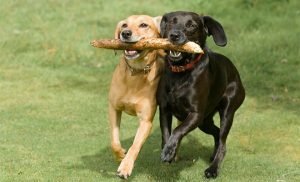 Develop social skills with fellow dogs. Understand its space, environment, and wants. … You should instill good traits. Working dogs or service dogs can be trained to perfection at this age. Identify ranking – dominant ones and submissive ones in the pack. Recognize the leader in the group. Interact with other animal species as well. The dogs start teething. It would signify that the dog would get into a habit of chewing things. Fear again sets in at the age when it is 4 months old. Fear would often inhibit a dog from doing a particular activity. Many people force socialization by compelling a dog to do a particular task against its wishes. This would only harm positive training in the dog. All in all, socialization helps a dog to be the pet you’d love to have. Under-socialized pets are cranky, prone to bite and scratch, aggressive, and hyperactive. They get stressed in unfamiliar surroundings and cause problem to the owners as well. Why let this happen? Socialize your dog to own an adorable pet. Here are some tips on socialization which you can keep as a checklist if you are socializing your pet dog. Various surfaces such as carpet, cement, wood, grass, dirt, puddle, and uneven stretches. Different playing objects, such as balls, soft toys, hard toys, fuzzy toys, and chewable toys. Various sounds while playing with toys, metallic, clicking, etc. Various locations such as neighborhood parks, people’s garden, kennel, vet’s hospital, grooming salon, beach area, pond side or river side, elevator, stairs, playgrounds, and so on. Different types of noises, such as doorbell, kids playing with one another, babies crying, vehicles moving, hullabaloo at the parties, and noises from machines. However, don’t go overboard with it if your pet is scared or irritated. Dog walking environment, such as experience cyclists going past, or kids running and jumping around. It should experience day-to-day movements that one can come across. The people it is staying with. It should not be jittery incase it is picked. It should not be worried or stressed if the vet or pet caregiver inspects its body. How to eat in different bowls, at different locations, and different food items. Left alone for half an hour or so. Leash trained and off-leash trained as well. …Don’t forget to make socialization experience happy, safe, and stress-free. Shower your pet with treats, loving pats, and praises to encourage it to socialize and learn positive behavioral traits. If your pet is scared or stressed, go slow. A dog which dreads and fears people or an object is likely to bite people.